Are you looking for conservatory roofing options, for a brand new or replacement conservatory roof? There are many different conservatory roofing options, from solid roofs, tiled roofs to glazed roofs. Whether you are looking to purchase a new conservatory roof or replace an old existing roof, we can put you in touch with up to 4 local installers. So replacing your conservatory roof will increase the value of your home. Here at Conservatory Online Prices, we’re dedicated to helping you find the best deal possible when it comes to your conservatory roofing options. There are a huge variety of roofline products to consider, and that’s why we’ve produced this comprehensive list of the many different styles that our local installers have available. Each has its own list of features and benefits that make it suited to particular projects and architectural styles. Read on to find out more! Since most conservatories follow a square or rectangular floor plan, you can expect the same from your conservatory roofing options. You’ll want to think a great deal about the style of roof that you want to complement the conservatory style you end up choosing. The roof is ultimately one of the most important aspects of any extensions since this is one of the main things that serves to protect you and your new extension from the outside world. Solid roofs offer privacy and security. Glass roofs offer incredible views and natural light. Whatever style you choose, you’re sure to benefit from a market-leading product; it’s just about choosing the features you like the most. Whatever you decide on, you stand to benefit from a weather-proof, highly-secure and thermally efficient product that will help to expand upon your existing home. What are your Conservatory Roofing Options? One of the most popular choices for a number of reasons, modern glass is well-suited to modern roofing. Durably designed to withstand the worst of British weathers and styled to blend in beautifully with the existing architectural design, glass offers high performance and incredible longevity. We highly recommend utilising this material if you want to experience the night sky whilst relaxing in the comfort of your conservatory once the sun has gone down. Modern glass is also designed as double glazing and specifically traps heat behind dedicated vacuum-sealed technology in order to trap heat easily within your conservatory. The result is a thermally efficient product that keeps you warm throughout the year without the need for excessive central heating. And some companies even offer self-cleaning roofs which utilise the natural strength of sunlight to reduce the need for constant maintenance. Affordably priced and easy to install, these lightweight roofs provide a surprising level of structural strength despite their low-cost design. These designs are great if you’re looking to replace an existing conservatory roof. With their lightweight nature means that you don’t have to worry about them being too heavy for the existing foundations. They are also usually translucent, allowing a certain amount of light into your conservatory without blinding the occupants. This can make them the perfect in-between that bridges solid roofs and glass roofs. While this glass-like surface may not benefit from all the thermally efficient characteristics of true glass conservatory roofs, it offers more privacy than a clear glass pane. Furthermore, if thermal efficiency is a serious factor in your installation. Many installers then provide solar inserts for polycarbonate conservatory roof options that more than makes up for it. Modern and striking, you may have seen this conservatory roof option adorning conservatories and orangeries across the country. Great at providing effective internal lighting whilst blending in with a solid roof, this architectural element provides natural light for a room with beautifully designed raised glass panes. 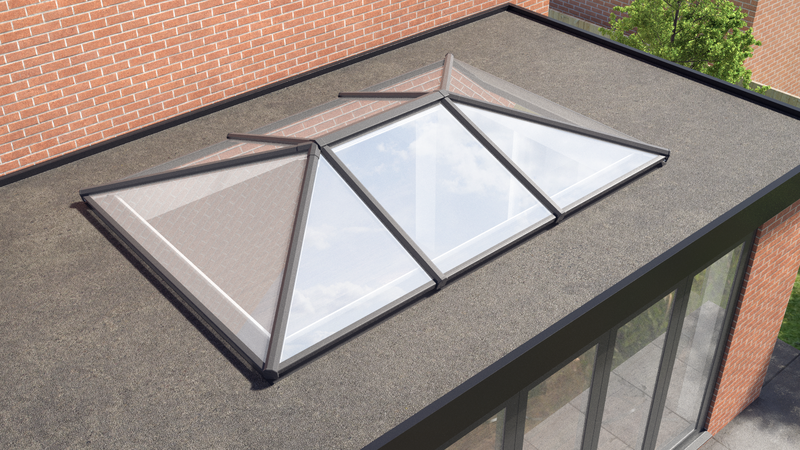 Popularised in Renaissance Europe, lantern roofs offer high-performance insulation and impressive weather-proofing properties. Their unique design can be easily shaped and moulded into any size you prefer and are affordably priced which is great if you’re working on a smaller budget. They’re also usually available in a variety of colours, meaning that you can match your new roof lantern with your conservatory and existing architecture more easily. 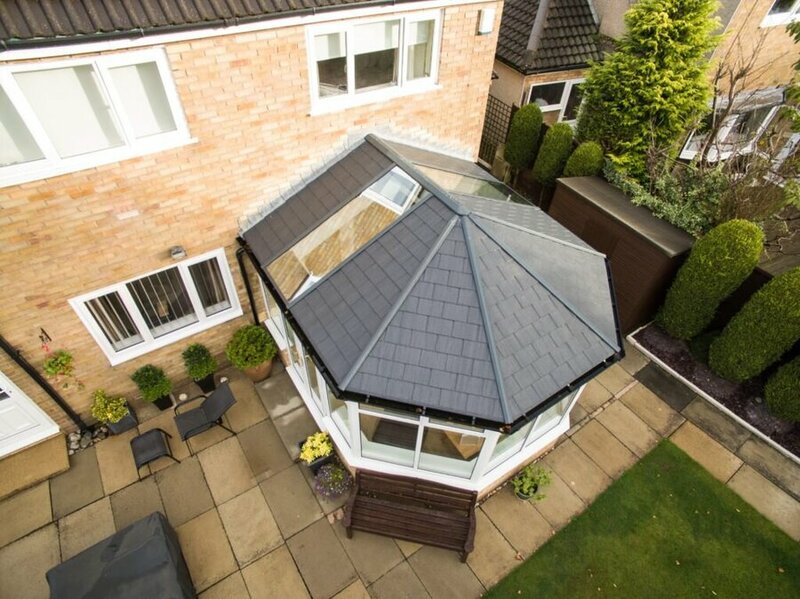 There are almost no planning permissions required with lantern roofs, so this is easily one of the best choices for anyone considering their conservatory roofing options. Solid conservatory roofs are excellent conservatory roofing options and are a very popular style among homeowners. A solid conservatory roof helps to transform your home into a classic home extension feel. Solid roofs are extremely energy efficient with its excellent control of temperature throughout all months in the year. This conservatory roof is a robust, sturdy design that offers you flexibility regarding light and heat. Solid roofs are a great choice if you’re looking for an incredibly secure conservatory roofing option. 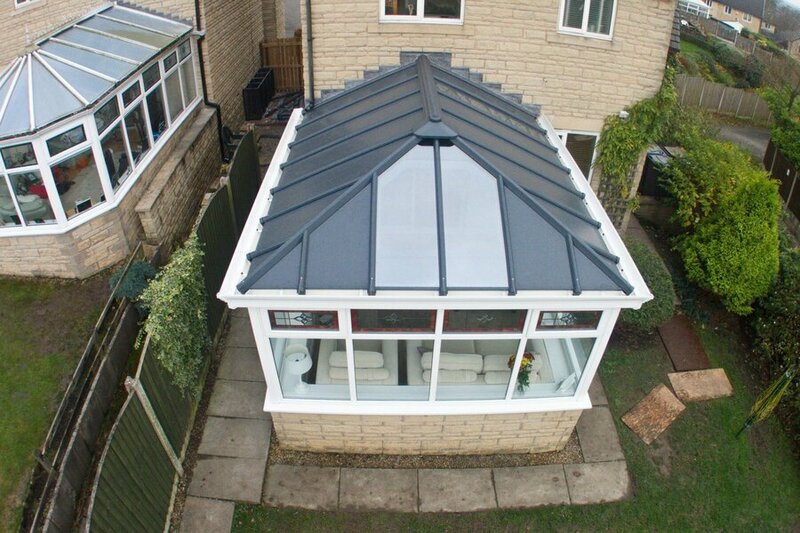 Stunningly designed, the solid build is popular in modern conservatory roof styles thanks to their simple and numerous customisation options. 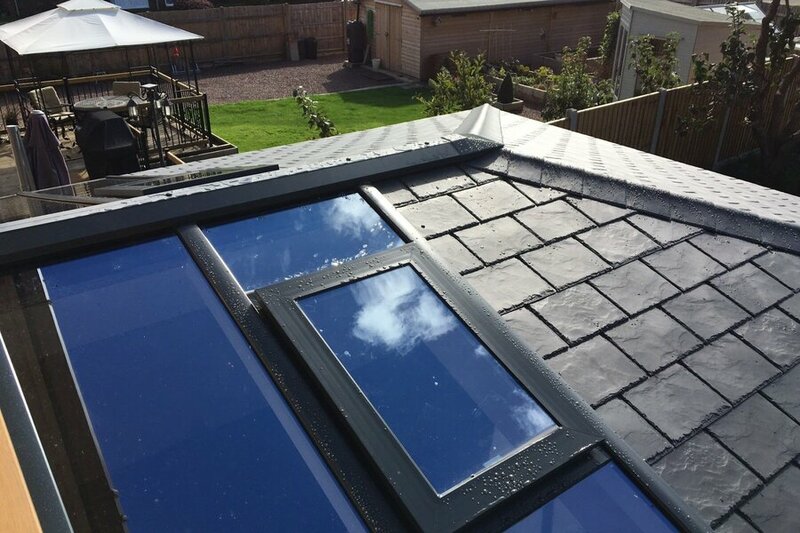 They also leave plenty of room to add in a roof lantern or skylight in order to enjoy the benefits of both double glazing and a solid roof. This design is also remarkably thermally efficient thanks to its insulating properties. A conservatory with a tiled roof is the most popular, natural home extension. Tiled conservatory roofs offer high levels of thermal efficiency, helping to retain valuable heat throughout all months. Tiled conservatory roofs can provide complete privacy to a brickwork conservatory or added privacy to an all-glass extension. Many homeowners are opting to replace their existing glass or polycarbonate roofs with a fully insulated conservatory roof. You can also modify your solid roof with tiles in many cases. These come with their own wealth of benefits. Aesthetically beautiful, tiled conservatory roofs are just as customisable as other roofing options. They also offer incredible acoustic insulation, creating a calm location in which you can relax in during the evenings. They are well-insulated, meaning that they can keep you warm throughout the year. No matter the weather, a tiled roof can increase the value of your home exponentially. If you want to combine the beautiful views of glass with the structural integrity and durability of solid roofs, then consider hybrid. Many of our local installers can offer this model, which means that you can enjoy a truly contemporary design. Often in a panel-system design in which panels can switch interchangeably between glass and solid materials. This high-quality design provides the best of both worlds. Modern double glazing offers incredible thermal efficiency, whilst also maintaining a level of durability and longevity that means they don’t require constant maintenance to keep them in top shape. These roofs can also come with an internal pelmet ceiling system and are easy to prefabricate for a swift and simple installation. Modern glass will also keep your home cool in the summer by filtering UV rays, whilst also keeping it warm in the winter with thermally efficient materials. What are you waiting for? Get your quote with Conservatory Online Prices here. Thinking About Replacing Your Conservatory Roof? Does a conservatory roof need planning permission? Replacing your conservatory roof can increase the value of your home significantly. Therefore many homeowners are opting to replace their existing conservatory roofs. However, are unaware of the conservatory roof planning permission requirements. A conservatory roof is exempted from planning permission, providing it does not affect the maximum height of 4 metres. The height must therefore not exceed the height of the first storey of the existing home. What are the benefits of solid or tiled conservatory roofing options? Solid and tiled conservatory roofs have a range of benefits that make them the most popular conservatory roofs. Increasing your home’s value, appearance, energy efficiency and reducing noise pollution are just a handful of benefits of these roof styles. How much does the average conservatory roof cost? The average conservatory roof cost ranges from £2,000 to £20,000. This price can vary between different conservatory roof styles, sizes and whether you install the roof yourself. As well as this, the cost of each roof style can alter based on the size of your conservatory, material and colour. There are many different roofing options for your conservatory from a tiled roof, solid roof, glass roof or polycarbonate roof. Depending on the style of conservatory roof that you choose, will depend on the final cost of your roof. If your existing conservatory roof is beginning to deteriorate, it may be time to consider upgrading to a new one. Visible signs that your conservatory roof is in need of improvements are draughts, leaks and cold spots. You may decide to upgrade your conservatory roof or simply to modernise it. Replacing an old conservatory roof can help to create a more energy efficient home. A new roof can reduce the level of outside noise and improve your home’s temperature. As well as this, a new roof can increase natural light and the view of your surroundings. What are the most popular conservatory roof options? All conservatory roof options are popular, depending on what you require from your new roof. 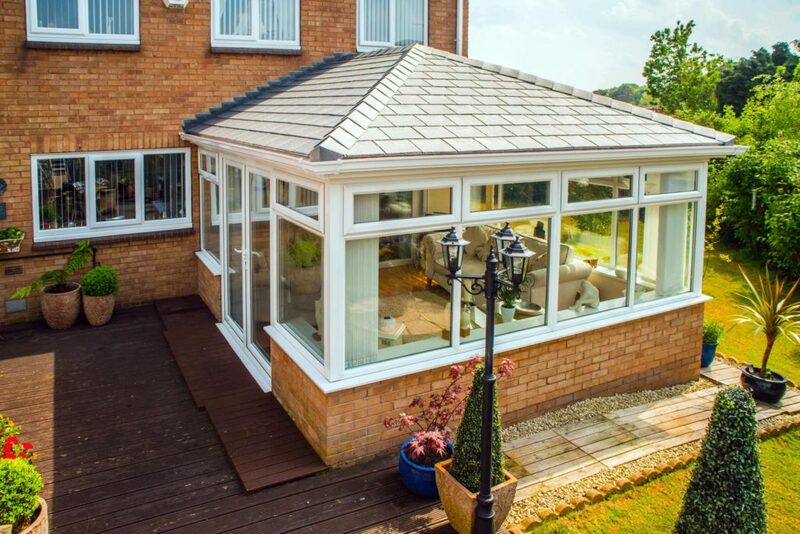 Typically a solid or tiled conservatory roof is more appealable, due to its all year round benefits. Tiled and solid roofs can match your aesthetic preferences, perfect for homeowners wanting to provide greater privacy. Also the most energy efficient roofing option, allowing you to keep cool in your home all throughout the year. Glass roofs are an excellent option for homeowners wanting to enhance the light in their home. There are many styles of glass roof options, from solar glass, self-cleaning glass and high performance glass. Polycarbonate roofs are undoubtedly the most cost effective roof design. With its lightweight structure, this roof can withstand extreme temperatures and filter our the sun’s high UV rays. The only element that homeowners are put off from is the noise level of the roof when it rains. Is your conservatory looking tired, worn and causing draughts in your home? It may be time to consider your conservatory roofing options. Start your free online quote and start your home improvement journey today. Alternatively, contact us via our online contact form and our team will be more than happy to help you. Whatever your requirements, whatever your needs, we have the conservatory roof knowledge to help you. Make the right decision for your home, taste and budget with Conservatory Online Prices.